One set of challenges down, thirteen or so left to vanquish. Lets see who hits a sophomore slump. That’s long enough for Gail to still be struck by pregnancy cravings. And what type of cravings, you ask. Red meat, spicy food, middle eastern cuisine, Asian cuisine, pasta . . . sounds like all foods hearty and filling. Who better to fulfill those cravings than our 14 cheftestants. For their Quickfire, they’ll have 30 minutes to make a dish that will satisfy Gail’s pregnancy cravings. Nilou Motamed, the editor of Food & Wine Magazine, will taste all of the dishes with Padma and select two finalists. Nilou will then fly back to NYC and make the dishes with Gail, who’ll select the winner of the Quickfire (what a fun way for Gail to participate in this season!). The winner gets immunity. We and the cheftestants all know how crucial immunity is, regardless of what point in the season we may be in. Most chefs are sticking to the types of foods that Gail mentioned—spicy food, tons of beef, etc. Some chefs, however, are making the type of food that they enjoyed when they (or their partners) were pregnant. Before we know it, time is up and the food looks amazing. The first group has a ton of steak—from NY strip from Adrienne and Brian, to rib eye and skirt steak from David and Brandon. Nini tries something a bit different with a Vietnamese braised pork dish. The second group has a bit more variety. Pablo does curried beets, Nathalie has a totally undercooked farro salad, Kevin has a beef and pork meatball, and Justin does beef tonkatsu. Kelsey, taking a cue from her own pregnancy cravings, does a grilled country ham. In the end, Pablo and Nathalie from the second group both have the worst dishes of the day, having undercooked their couscous and farro, respectively. As for the winners, it’s David with a perfectly cooked steak and frat-boy Brandon with great BBQ flavors who’ll have their dishes made for Gail. One will get immunity, but they won’t know until the next day. Before that happens, the chefs get treated to an amazing visit to the Maker’s Mark distillery. It’s an amazing campus, with tons of foliage, cool architecture, and, of course, tons of bourbon. They’re even treated to a gigantic feast of classic Kentucky dishes. With the booze flowing and the food stacked up by the plateful, the chefs get yet another fantastic opportunity to bond. The Judges won’t let that go on for too long. Predictably, Padma shows up with a knife block. As probably every cheftestant saw coming, they’re split into two teams and will cook a family-style meal for 48 folks, with each chef responsible for doing at least one take on one of the dishes they just ate. The challenge is to take something quintessentially Kentucky and make it their own. Furious bouts of menu planning commence, each led by a female chef. 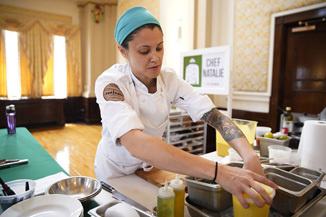 On the Black Team, Kelsey organizes things, even as a lot of chefs start pulling off into a number of different directions. On the Red Team, Kentucky Girl Sara keeps a tight grip on the dishes and composition—she does NOT want to see her team mess up her adopted city’s cuisine. Also, she’s looking to get a little bit of vindication after coming in last in her group during the previous Elimination Challenge. Meanwhile, Nilou and Gail are cooking up a storm in Gail’s condo. They dig into Brandon’s bulgogi bowl, which has nice heat and is super savory. They also whip up David’s rib eye dish, which is sweeter than Gail expected, but has an interesting combination of flavors. Nilou leaves without disclosing Gail’s decision.